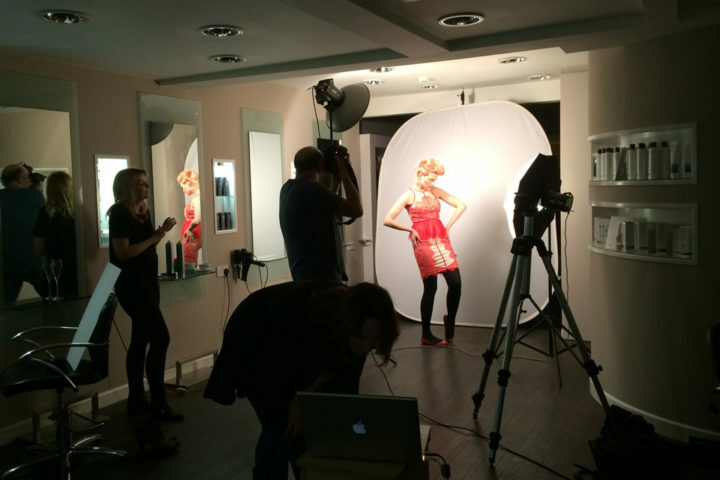 March saw us busy with our Pure Hair photo shoot for the prestigious UK Wella Trend Vision Awards. Laura worked with award-winning photographer Jim Callaghan, national fashion stylist and make-up artist Justine Collins and clothes from Revolve to create an edgy look which we hope will catch the judges’ eye. Professional model Chloe came up from London and, after a hard evening’s shoot, dashed off to catch a flight to Berlin for a bridal show the next day. Phew – exhausting! Justine, whose work has been showcased in Perfect Weddings, You and Your Wedding, Hello, Hairdressers’ Journal, Bride, Glamour, OK and Cosmopolitan amongst many others, complemented the fashion-forward hair with soft make-up to create a stunning look for this highly prestigious hairdressing competition.